This month we will enjoy a trunk show given by Karen Michelle. 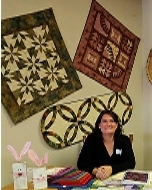 Karen teaches at the Lady Bug Quilt Shop in Manteca on a regular basis. She has a wonderful variety of quilts using a multitude of quilting techniques to share with us. One of her popular classes uses a foundation piecing technique. This is much like paper piecing but you do not tear out any paper. Come to the meeting and see her collection of Quilts.